Just like the second Fantastic Four movie, Green Lantern featured a baddie who was... somewhat abstract. But it didn't have to be like that. Legendary concept artist Peter Rubin (Independence Day, Stargate) was hired to create the big bad Hal Jordan would have to fight in the movie's climax. And now, a new crop of unused concept art from the feature reveals the many different looks the Parallax could have had in the grand finale. Could a different-looking villain have saved this film? Thanks to Comic Book Movie, we now have a collection of interesting Parallax pics to sort through. We kind of like the black oozing tar beast, but then again we've already had one amazing chocolate pudding monster — and he could sing. Anyway, here is a video of what it DID end up looking like. Thoughts? Personally I don't think the Parallax look is to blame for the problems with Green Lantern... although it didn't help. 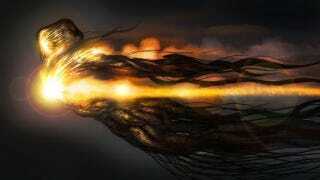 For even more concept art, head over to Comic Book Movie.